Bruges, I think, is one of Europe’s most handsome small cities. That perfectly preserved centre with its fairytale buildings made us feel like we were on a film set or that we’d been transported to another era. The architecture is just stunning with styles ranging from medieval to the nineteenth century. All of that and then those picturesque canals – the icing on an already great cake. We loved everything about Bruges and when you mix in a laidback atmosphere and the fact it is stuffed to the brim with chocolate, chips and beer – perfect is the only way to describe it. Everything under the sun, it was eclectic and wonderful. We browsed for ages. Son with holiday money to spend, got on with some serious shopping and ended up with a model of a tank in a glass case and an old war medal. One happy customer more than satisfied with these dusty treasures. A gorgeous smell of warm coconut was wafting through the air, we followed our noses to a stall selling delicious coconut ball things (no idea what they were called) but incredibly tasty, we feasted on a bag of these treats as we strolled. The centre of Bruges is stunning. Other cities may boast palaces and cathedrals, here there are guildhalls, warehouses, exchanges and the former houses of wealthy merchants. 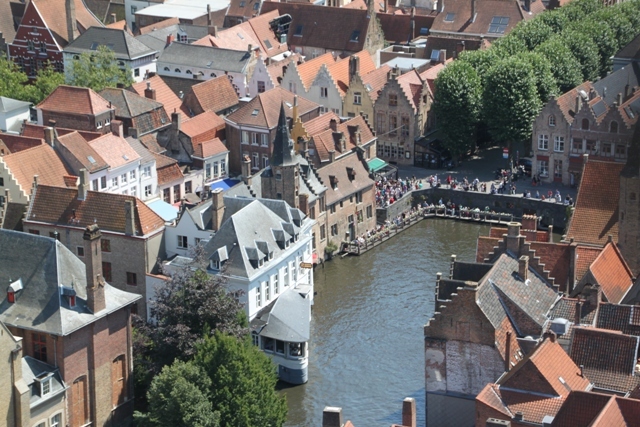 In the fifteenth century Bruges was a centre for the Hanseatic League, a confederation of merchant cities that joined Europe together in trade. 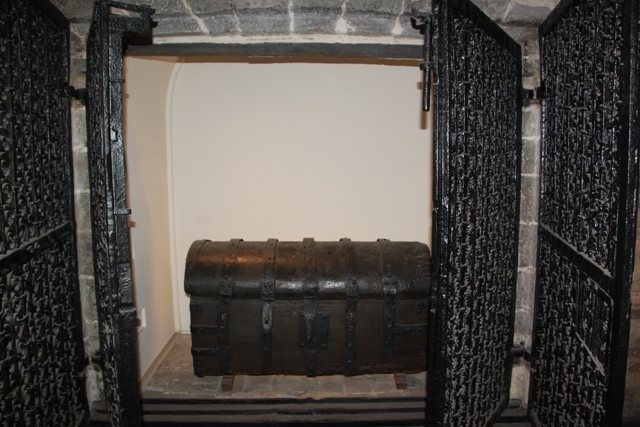 It became one of the wealthiest places in medieval Europe. The fairytale mix of gabled houses, magnificent squares, narrow cobblestone streets and meandering canals from those times remain. We found our way easily to Markt, the centrepiece of the city. 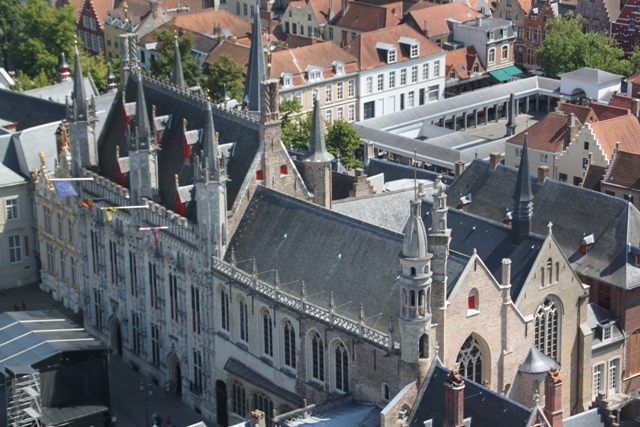 It has the huge Belfry tower on one side and dozens of restaurants, shops and bars. We had a drink in one of the bars on our first evening, a lovely setting overlooking the square where we paid three times as much for a drink as a couple of streets along. Lesson learned, we found several places by the canals on subsequent evenings and had drinks for half the price. A climb to the top of the Bell Tower was our goal for the morning – a bit of a queue as only seventy people can be up there at any one time but a silhouette artist kept us entertained while we waited. We clambered up 366 steps to the top for a panoramic view of the city. 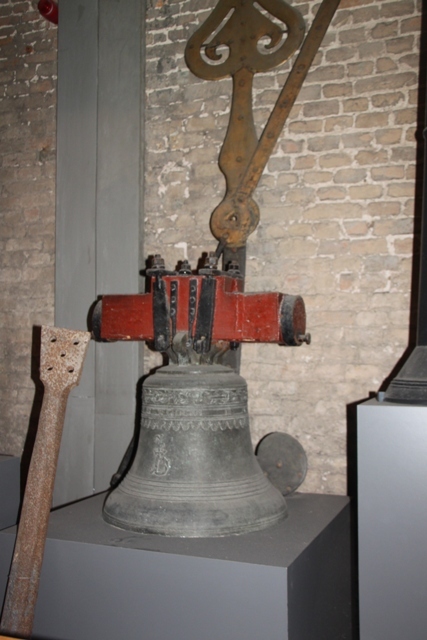 Not as bad as it sounds though, you can catch your breath on the way up at the treasury where there is an interesting display on the clock mechanism and the bells. 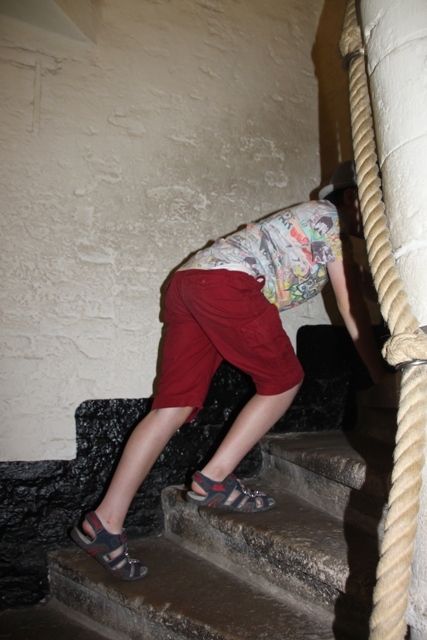 The stairs are extremely narrow and with only one way up and down, sometimes we jammed ourselves against the wall to allow people to pass, other times we hauled ourselves up the steps using a rope. Never a dull moment. After a bit of people watching in the square, we turned into Breidelstraat past so many lace, chocolate and biscuit shops. Unable to resist the lure of the chocolate, we also browsed in the Christmas shop and left with a Bruges bauble. Burg was last on the Sunday strolling list – a square with a gorgeous mix of architectural styles and the site of the Town Hall. Built in the late 1300’s this is the oldest town hall in Belgium. A smaller square, I especially loved the old Civil Registry with its gold statues. Son especially loved the ice-cream shop – our next and for him most important of call after all that strolling and tower climbing. 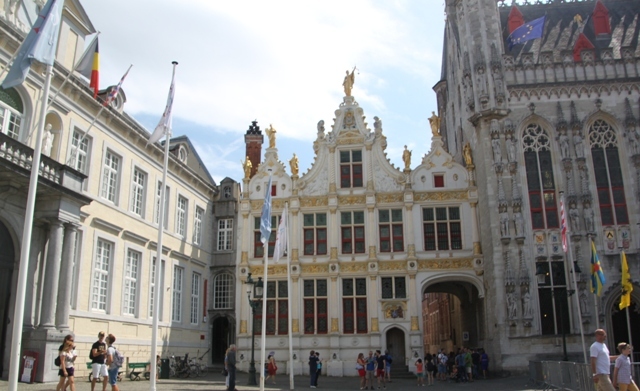 We stayed for a week in Bruges Rosemary, spent about a day and a half exploring the city and then strolled around in the evening but also managed lots of trips out to the WW1 sites and museums and the coast. It was such a great spot to stay and I totally agree about it being so manageable. We did a canal cruise too – was just thinking about a post, I didn’t love it so much, had done one in the past and thought it was wonderful, this time we were packed in like sardines, quite a different experience!! Still…. Hope your week is going well too, we are in the throes of school holidays, just back for a week and then heading off to the seaside for (hopefully) sea and sun!! I love Bruge and would love to visit again. That flea market looks wonderful. I’m certain my kids would scoop up loads of treasures there. 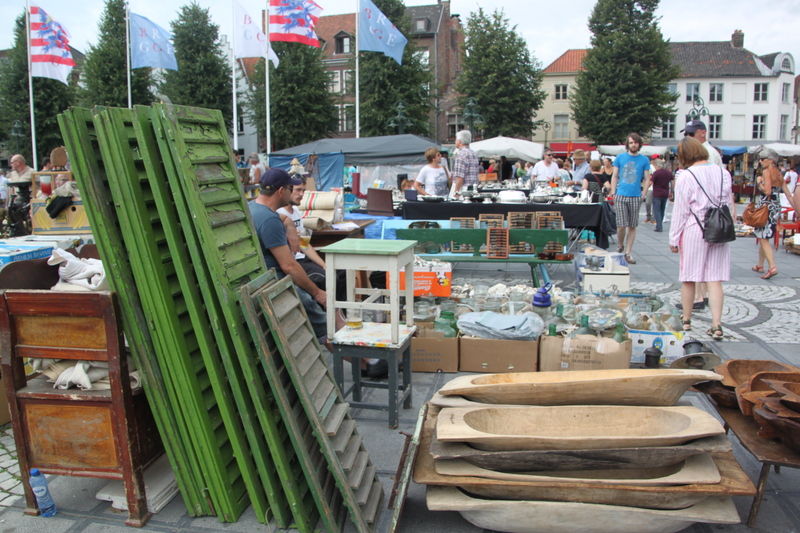 The flea market was one of our Bruges highlights Laura, we came upon it unexpectedly, so much of just about everything under the sun, it was incredible. Our son, not a happy shopper normally was really in his element. Hope your school holidays are going well! Those unexpected, unplanned for things often end up being the highlight of a trip. Twice now (in Bayeux and Quebec City) we’ve pitched up to find ourselves in the middle of some huge cultural-historical festival we had not known about. Then there’s the random stuff that makes for great anecdotes. 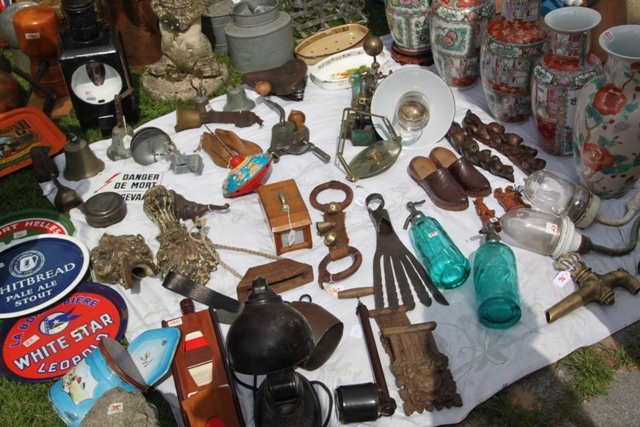 There’s nothing better than a flea market on a sunny day! 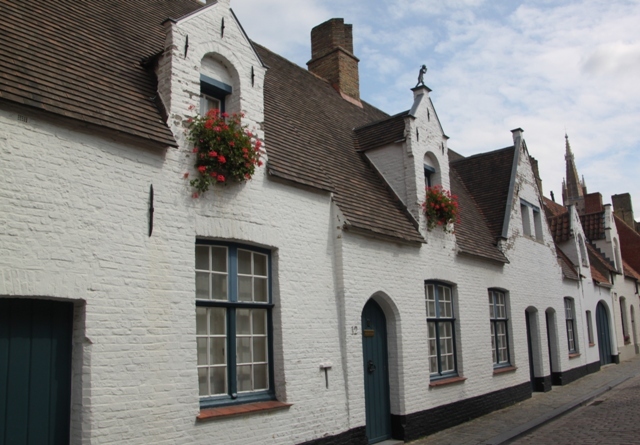 I keep hearing wonderful things about Bruges–it looks great! We loved it – a beautiful city but also perfect for exploring other parts of Belgium too. 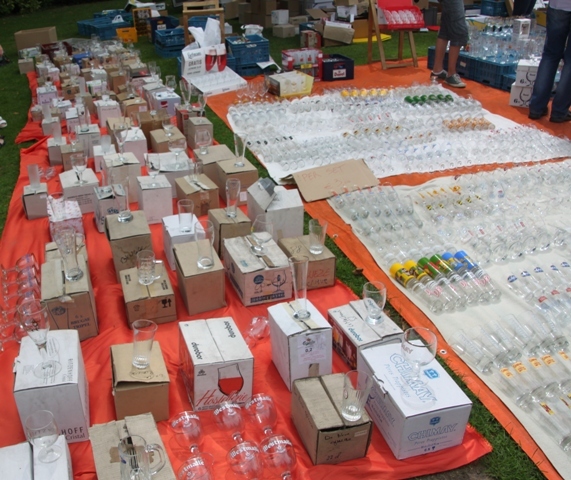 The flea market on a Sunday morning was amazing – we strolled for hours, so much incredible stuff on sale, I just loved it. What a beautiful city! The buildings are gorgeous. Just like a fairytale aren’t they? Every one is a beauty I think. Missing Bruges when in Belgium was a definite mistake on my part and I must fix that. Thanks for reminding me. What a delight! 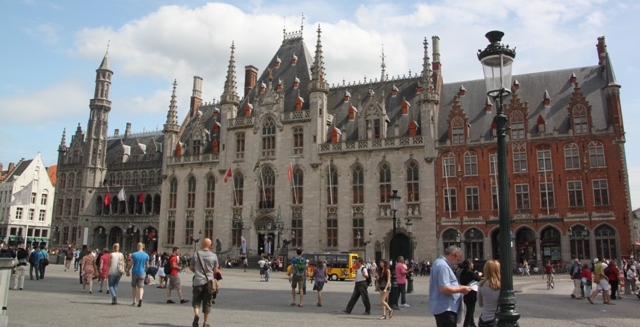 Oh it is just gorgeous – we stayed in Bruges for a week, it’s small and compact so you can see everything in a short amount of time, also a great location for exploring the coast and the World War 1 war sites. Staying in the city too meant that we could wander in the evening when the crowds had gone, that was really special. Definitely – what’s not to like!! It’s gorgeous. Love those pictures over the rooftops! Such a cool view. Yes, stunning isn’t it – definitely worth climbing up all those steps of the tower for this! I’ve seen that movie Suzanne but ages ago – I think I need to watch it again!! We loved it here too, the weather was hot and sunny – probably a bit different to January but I’m sure in winter it must be gorgeous as well. We had the most wonderfully sunny weather Erika which made an already stunning place even better. I can imagine that vividly, Joy! 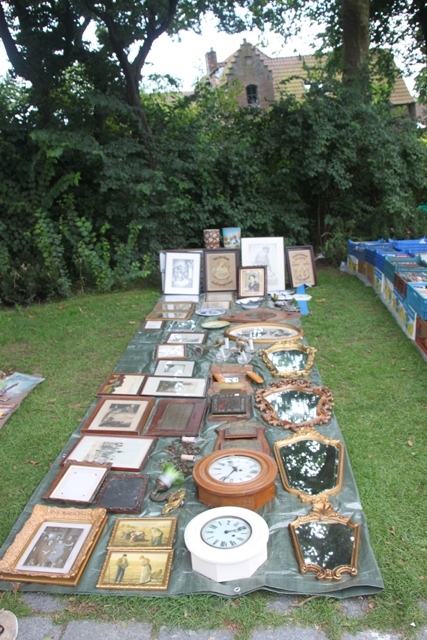 Wow- what an amazing flea market! Those are always my favourite. Especially in other countries – so much of the “stuff” is completely new to us. (Plus quirky. 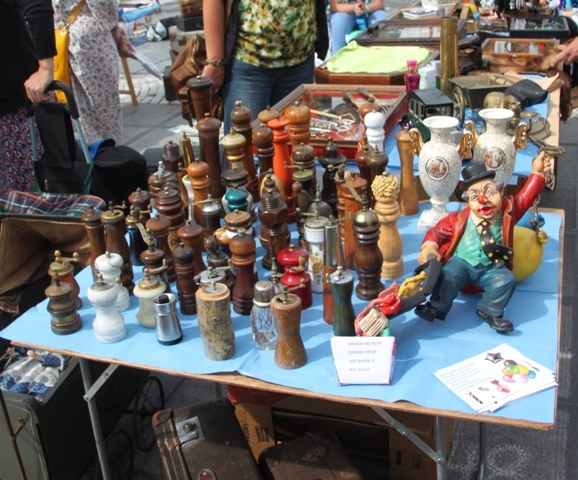 Who collects that many pepper mills?!) I also loved the colourful architecture… Your pictures made my day. Thanks for sharing! That was exactly it – the stuff was so new to us, so varied and absolutely fascinating. Strolling and wondering where it all could have come from – that was great fun. Bruges is a gorgeous city and this fabulous market made our day!! This one was just incredible – never seen that amount of “stuff” before – everything almost under the sun. It was amazing – our son especially thought it was heaven!! I got to visit Bruges for the first time a couple months ago while we were traveling through Europe and it quickly became one of my favorite cities in Europe. I loved the fairytale, romantic atmosphere that the city held and the architecture was some of the most beautiful I’ve seen. Climbing the Belfry was one of our favorite things we did! We also rented bikes and biked out to a small village called Damme in the Belgian countryside and that was spectacular! Your photos are beautiful 🙂 I’m glad you enjoyed Bruges as much as we did. Sounds like you had a fantastic trip too Kate. 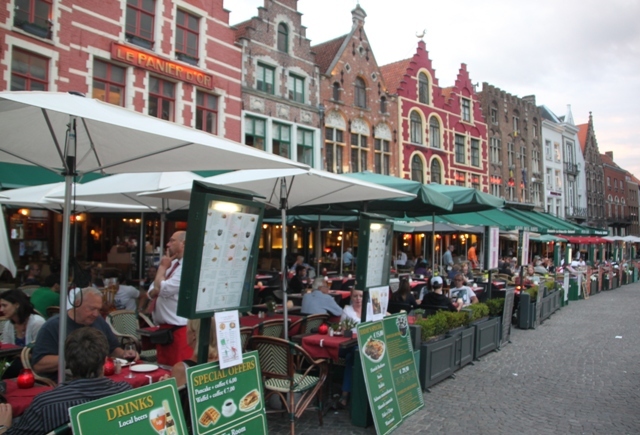 We just loved Bruges, like you said it has a fairytale appearance and is just gorgeous. We did the cycle to Damme as well – loved that too, such a lovely day out and an easy cycle – that works for me!! I agree. Bruges is perfect. I love that Sunday morning market. They had the most hilarious taxidermy and just random crap when I went to it, and it was amazing. I was disappointed it wasn’t on when I was in Brugge a couple months ago, because there was some lame carnival in the centre instead. That market was the main reason I wanted to stay in Brugge for the whole of Sunday! I would have been gutted to miss it too – we didn’t know about it before we went, came upon it unexpectedly and just loved it. I have never seen such a collection of everything and anything, we browsed for hours and I’d definitely go back and do it again. What a stunningly gorgeous city. At some point, some day, I’ll have to try and get there. Thanks so much for this review and the photos that reflect the pulse and history of the city. It is a real beauty George – there is not a single street or spot that is not picturesque and gorgeous. missing Bruges when I saw your post. I know – we’re missing it too having left now! Thank you!! We just loved Bruges – and Ghent!! Such a great place and so many interesting other places and sidetrips – not less the WW1 war sites. We all loved Belgium and would go back in a heartbeat. Yup straight on to the “must go back again” list. Especially after watching the movie Monuments Men. That’s a good point – need to watch that movie again too!! Seen it in the past but definitely need to revisit!! Someone else reminded me about In Bruges – two to go on the movies list!! I love visiting flea markets while traveling! You can get a distinct feel for the “trash vs treasure” sentiment. Did you find any treasures to take home with you? We took home some glasses and other bits and pieces – our son loved all the WW1 stuff and found a little tank model and a medal. That was before all the edible treats…. needless to say none of those made it home!! 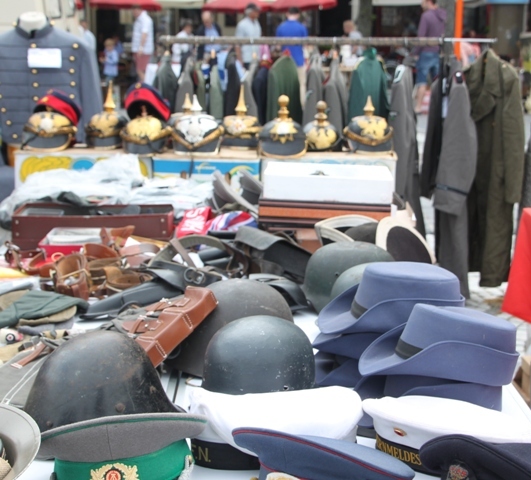 It would’ve been cool to see the WWI stuff…we don’t see that in flea markets in the US. We went to Bruges for our honeymoon last year and loved it as well (especially after all the tourists left on Monday, haha!). Now I want to go back and find the flea market! The flea market was amazing – so much of just about everything under the sun, definitely recommend if you find yourselves back there on a Sunday morning. We loved it – and Bruges!! Bruge sounds like my kind of town! I love coconut so I would definitely have to hunt down those coconut ball things! It’s just a great place – beautiful with bags of culture and a fabulous atmosphere. The coconut things were excellent – I would hunt them down again too! !